Children are able to learn a foreign language much more easily than adults. This notion has led to the introduction of foreign language classes in elementary school. Results of electrophysiological experiments published by the group of Professor Urs Maurer, however, indicate that the current practice of foreign language teaching may not be effective. Learning a foreign language, notably English, has become increasingly important in current times of globalization. Children are therefore exposed to foreign languages as early as at elementary school. The question is how much exposure is needed to effectively learn a new language and how can this be measured. Previous studies have shown that learning a new language by daily exposure changes the way this language is processed at the neural level. A useful way to investigate neural mechanisms underlying speech is the mismatch negativity (MMN) that compares electrophysiological signals in different brain regions. MMN has been shown to be a promising tool to demonstrate the existence of language-specific memory traces in the cortex: for native languages the MMN has been found to be more pronounced than for foreign languages. Lea Jost in the group of Urs Maurer has measured MMN in monolingual Swiss German-speaking children both before they started to learn English at school and after one year. As distinguishing speech sounds plays a crucial role in understanding a spoken language, the children were exposed to three different speech sounds “da” (standard), “ta” (common in German) and “tha” (common in English) and their reaction to these sounds was measured using EEG. 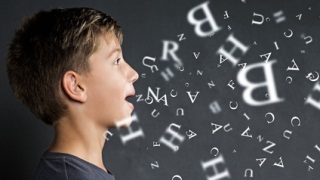 Interestingly, the children in Jost’s study did not show a difference in MMN between the tests done in the 1st grade and 3rd grade, suggesting that no additional resources in the brain were committed to the new foreign speech sound. The authors conclude that two lessons of English per week are not sufficient to drive commitment at the neural level.